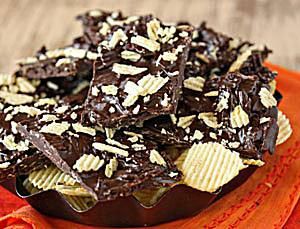 This Potato Chip Chocolate Bark contains only 2 ingredients, but when those ingredients are chocolate and potato chips, what else do you need? Each bite is salty, sweet, crunchy, and smooth--this may just become your favorite new guilty pleasure! For variety, try adding other favorite salty snacks, like crushed pretzels, or include a few sweet mix-ins as well, like toffee bits. 1. Cover a baking sheet with foil, parchment paper, or waxed paper, and set aside for now. 2. For this recipe, you'll want to either use tempered chocolate, or chocolate candy coating. Both of these options will give you a candy that remains stable, shiny, and solid at room temperature. Simply melting regular chocolate might give you a candy that is soft and easily melted at room temperature. If you do choose to simply use melted chocolate, it's best to store the finished candy the refrigerator. For instructions on tempering chocolate, click here. 3. Temper the chocolate or melt the chocolate candy coating in the microwave until it is melted and fluid. 4. Add about 2 cups of the crushed potato chips to the chocolate, and stir until well-coated. 5. Pour the chocolate out onto the prepared baking sheet, and smooth it into an even layer using a spatula or a knife. While the chocolate is still wet, sprinkle the top with the remaining crushed potato chips and press down on them gently to adhere them to the chocolate. 6. Allow the bark to set completely at room temperature or in the refrigerator. Once set, break it into small pieces by hand. This bark will keep for several weeks, but the potato chips on top will start to get stale after several days. If you need it to last longer, consider omitting the crushed chips on top of the bark. Click Here for All Bark Candy Recipes!